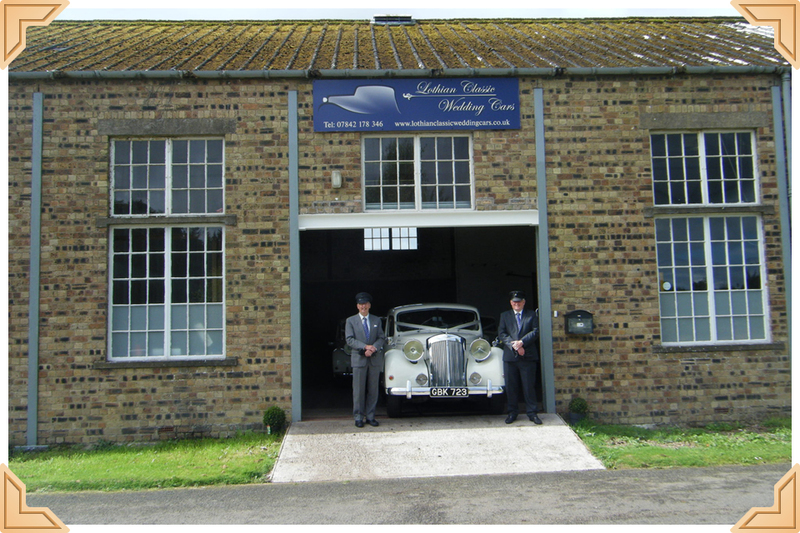 Lothian Classic Wedding Cars is a family run business based at Newbattle Abbey Business Park, Dalkeith, Midlothian providing a vintage and classic wedding car hire service throughout Edinburgh, the Lothians and Borders. Our classic wedding cars include a pair of 1950’s Austin A.125 Sheerline Limousines in old English white and ivory which can seat up to 8 passengers, a cream 1950 Austin A125 Sheerline saloon, a two tone black and cream 1952 Austin A.125 Sheerline saloon, a two tone Daimler DS420 Limousine formerly owned by the Lord Mayor of London, two matching Daimler DS420 Limousines in ivory which can seat up to 7 passengers a 1948 Bentley Mark VI in two tone black and fawn and a 1948 Triumph Razoredge saloon in black and ivory which appeared in “The Crown” and “The Stone of Destiny”. Our cars can be booked in any combination with discounts available for additional cars and single journey. Hourly rate of £125 per hour available for shorter hire periods and discounts available for midweek hire. Also available for special birthday & anniversary celebrations, school proms, corporate events and filming. Rear parcel-shelf silk flowers and satin bridal ribbon are included in the price. Umbrellas are carried on-board just in case. Our vehicles are available to view in our showroom at Newbattle Abbey Business Park, Dalkeith on Sundays 2pm-4pm or by appointment. Please call 07842178346 to make an appointment or complete the form on the ‘Contact Us’ page of our website.